Ah, smoothies. If there’s something I crave on a daily basis, it’s healthy vegan smoothies. I think of smoothies as salads with the taste of a dessert. I remember the first time I started drinking smoothies in 2010, my family and friends would look at me like I was a weirdo, eating blended kale. Since then, healthy vegan smoothies have hit the mainstream and for a good reason. Actually, numerous reasons. The number one reason people incorporate healthy vegan smoothies in their diet is that they are nutrient dense, packed full of vitamins, minerals, fiber, antioxidants, and water. Since you can prepare smoothies in seconds, they’re a great way to get your daily recommendations of fruits and veggies in. There’s nothing as quick and easy as throwing loads of veggies and fruit into the blender and pouring it into a jar when you don’t have time to prepare a full on meal. Taking your smoothie with you is an additional convenient option. Depending on the ingredients you use, smoothies can serve many purposes. Need something detoxifying to help you slim down? Add some leafy greens and herbs like parsley, cilantro, or mint to increase the fiber content and cleanse your system. Looking for a filling lunch on the go? Add some nuts and seeds or avocados to boost the protein and healthy fats. Craving an energizing snack? Add more fruit and some superfoods. Perhaps you lead a stressful lifestyle and need to ease the burden on your digestion. Well, blending helps to break down the cell walls and makes nutrients more readily available. The blender essentially “chews” the food for you. Smoothies are so versatile. You can add anything you like and keep out anything you don’t. 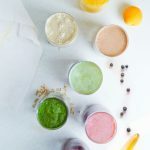 However, until you become comfortable with creating your own smoothies, it’s always best to follow a foolproof formula so your smoothies always taste amazing. While there’s one base formula you can follow every single time, you can always tailor your smoothie to reach your personal goals. So let your creative juices flow and have fun experimenting with different flavors. Here are some of the most popular types of healthy vegan smoothies. Apples – apples are full of fiber and nutrients that stimulate bile production to help the liver get rid of some toxins. Apples are also a good source of the soluble fiber pectin, which can help detox metals and food additives from the body. Be sure to eat only organic apples, as conventional apples are some of the most heavily-sprayed foods around. Smoothies are excellent for weight loss because you can get all essential nutrients in one glass without adding any empty calories. While many of the traditional ingredients in healthy vegan smoothies support a healthy weight, some are better than others. The goal when trying to lose weight is to eat a greater volume of food that’s low in calories. 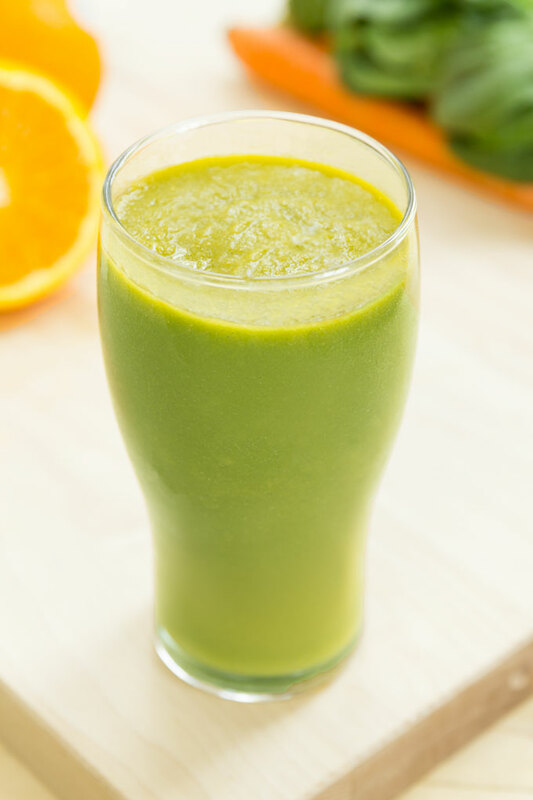 A good weight loss smoothie should include not only veggies and low-sugar fruits, but also protein and healthy fats. Berries – any type of berries are full of nutrients but low in calories. Berries aid in weight management by increasing metabolism and preventing food cravings. Cayenne peppers – this spice not only adds a kick to your smoothie, but it also speed up your weight loss. The active ingredient, capsaicin, is a natural appetite-suppressant and a metabolism booster. Cayenne pepper is also thought to help burn calories because it’s spicy and causes your body’s temperature to rise. Chia seeds – these little seeds are one of the most nutritious foods on the planet. They are high in fiber, protein, and healthy fats, which help you feel full and satisfied for a long time. Cucumber – low in calories, but high in water, cucumbers are another great weight loss food. Adding cucumbers to your smoothies is a great way to increase the volume of your food without increasing calories. Grapefruit – whatever color you choose, the calories in grapefruit are very low. In fact, grapefruit is one of the “negative calorie” foods – meaning it takes more calories to digest it than exist in the fruit. Grapefruit also lowers insulin levels and prevents the body from storing as much sugar as fat. 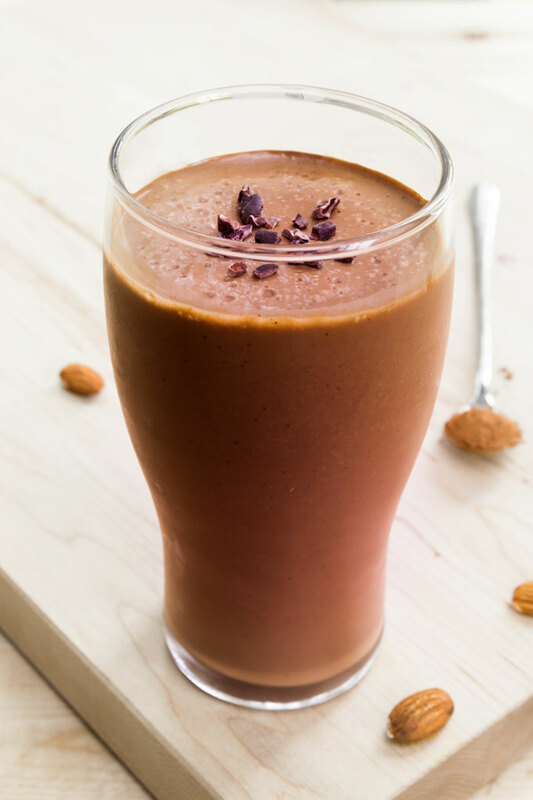 We all can use more energy and a healthy vegan smoothie is a great way to power up your day. Your body responds the best to living and easily digestible foods. Taking steps to make better choices about what you eat and drink can reverse your fatigue and give you back the energy you need. Adaptogens – when your adrenal glands are worn out, adaptogens can restore balance in the body. An adaptogen is essentially a herb or food that help you better cope with stress. Some of the most known adaptogens include ashwagandha, ginger, maca, or Siberian ginseng to name a few. Bananas – bananas are an excellent source of energy. Containing three natural sugars – sucrose, fructose and glucose – combined with fiber, bananas provide an instant, sustained and substantial boost of energy. Leafy greens – here they are again. Leafy greens, especially dark leafy greens, are loaded with B vitamins, aka the “energy vitamins”. Pineapple – the natural sugar in any fruit provides a quick pick-me up when you’re dragging. In addition, pineapple is also high in vitamin C (which helps turn fat to energy), and iodine (which controls how quickly your body burns energy). Antioxidants are substances that protect your body from damage caused by free radicals. Free radicals can accumulate in your body through air pollutants, unhealthy processed food, pesticides and herbicides, medication, etc. and cause cell damage (a process known as oxidation). The good news is that you can pack your smoothie with some “free radical fighters”. To measure the antioxidant power of different foods, the National Institute on Aging (NIH) has developed the ORAC scale (Oxygen Radical Absorbance Capacity). Acai berries – made from freeze-dried acai berries, acai powder acai berries score 102,700 μ mol TE per 100g on the ORAC scale. According to research, acai berries contain more antioxidants than any other food. They are extremely high in flavonoids, antioxidants that support balanced cholesterol levels, and other antioxidants, such as vitamins A, C, and E.
Cinnamon – the health benefits of cinnamon are attributed to flavonoids and tannins, antioxidants that fight oxidative stress in the body. According to the ORAC scale, cinnamon has a score of 267,537 μ mol TE per 100g. Cloves – second only to raw sumac bran, ground clove has the astounding ORAC value of 290,283 μ mol TE per 100g. Same as cinnamon, cloves are an excellent source of flavonoids that fight oxidative stress in the body. Goji berries – what’s special about goji berries is the bright red color, which offers unique health benefits. The red flesh and pulp contain carotenoids, which are excellent for eye health. Other antioxidants found in Goji berries are vitamin A and C. The ORAC scale gives goji berries a score of 25,000 μ mol TE per 100g. Wild blueberries – wild Blueberries contain 2x the antioxidants of regular, cultivated blueberries. Wild blueberries are particularly high in flavonoids. With a 14,000 ORAC score, wild blueberries contain the highest antioxidant capacity of all commonly consumed fruits and vegetables. 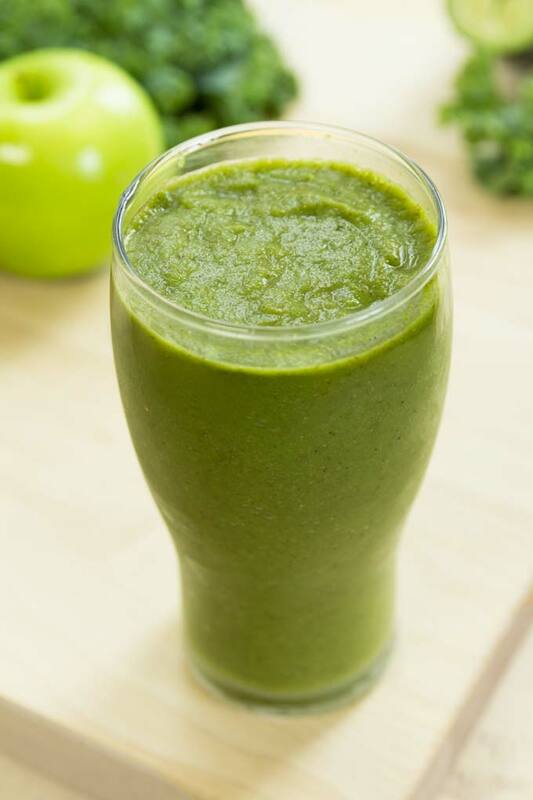 To bring your antioxidant smoothie to the next level, use green tea as the liquid base. Green tea, particularly matcha tea, is a powerful antioxidant rich in flavonoids and catechins. Inflammation is a natural protective repair mechanism of your body. However, when inflammation becomes chronic, it’s like having the alarm bells going off in your body 24/7. The easiest way to help your body repair naturally is by incorporating some anti-inflammatory foods into your smoothies. Flax seeds – even better than ground flax seeds, flaxseed oil is a great way to add omega-3s, which are essential fatty acids that cool down inflammation. Flax seeds are also packed with antioxidants lignans, which are also known for their anti-viral and antibacterial properties. Ginger – this slightly spicy root works kind of like a natural ibuprofen. Of the 115 different chemical components found in ginger root, the healing benefits come from gingerols. Gingerols are bio-active ingredients that act as highly potent antioxidant and inflammatory agents. Pineapple – aside from vitamin C, pineapple also contains a protein-digesting enzyme bromelain. Bromelain is a potent anti-inflammatory and anti-swelling agent. Eating the fiber-rich core of a juicy, ripe pineapple is the best way to consume natural sources of bromelain. 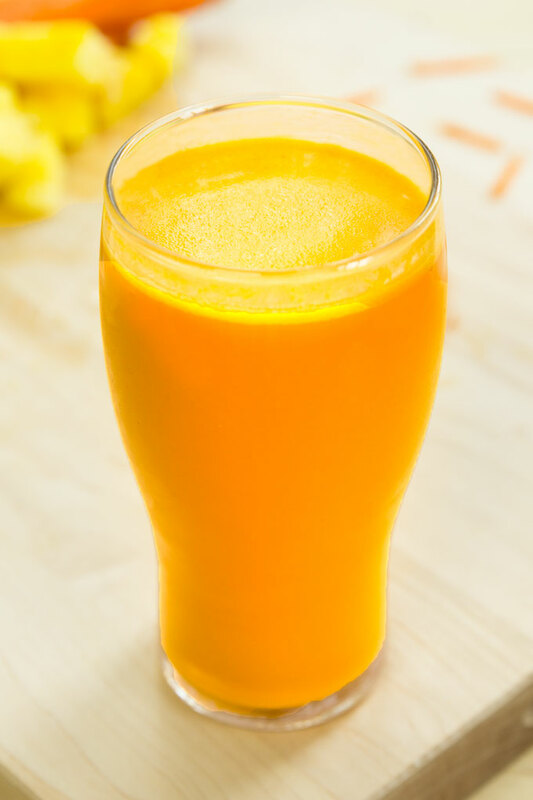 Turmeric – turmeric is like an anti-inflammatory gold. It adds not only golden color and a kick to smoothies, but also anti-inflammatory flavonoids. The active ingredient in turmeric – curcumin – is a strong anti-inflammatory. It’s so powerful that it matches the effectiveness of some anti-inflammatory drugs. Walnuts – walnuts are the richest source of anti-inflammatory omega-3 fatty acids among nuts. They also inhibit the production of certain neurotransmitters, which increase pain and inflammation. A nutritious breakfast or a snack before hitting the gym provides the body with the fuel it needs to gain muscle and burn fat. 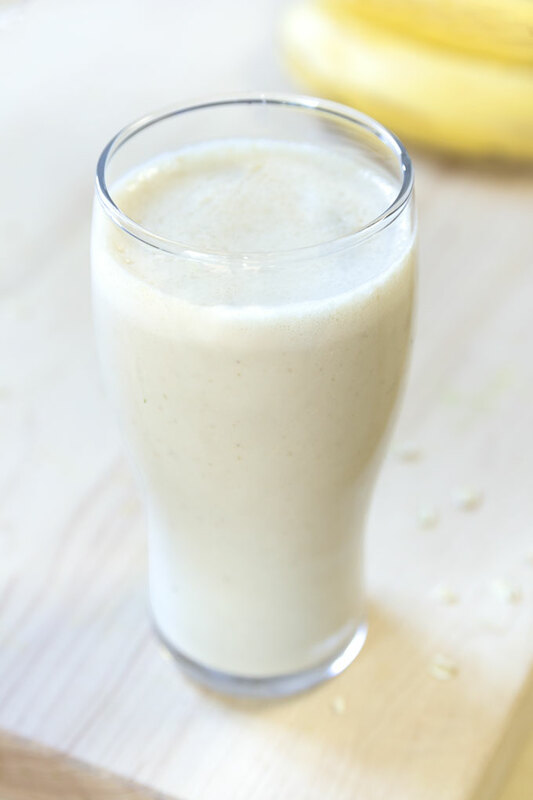 Even if you aren’t planning on hitting the gym the first thing in the morning, there is no better way to start the day than with a fresh nutritious shake, aka breakfast smoothie. With the right foods, your morning smoothie can give you a boost for the rest of the day. Bananas – bananas are packed with potassium, which aids in maintaining nerve and muscle function. The body doesn’t store potassium for very long, so a medium banana before a workout will help keep nutrient levels high. Chia seeds – known for their hydrating properties, chia seeds make a great pre-workout energizer. They are also a complete protein source, packed with fiber, magnesium, iron, and B vitamins. Dates – if you’re in a pinch and need a quick source of energy, dates are where it’s at. Dates are also high in polyphenols – antioxidants which combat oxidation in the body during a workout. They are also low-medium on the Glycemic Index so they produce smaller fluctuations in blood glucose and insulin levels. This is important for sustained energy without the sugar crash. Maca – One of the properties of maca is that it boosts energy, but it does so in a balanced way, unlike caffeine or sugar. This gives you increased endurance and muscular stamina which allows you to work out longer and more intensely. Oats – since oats are slow-digesting carbs, they are an excellent source of lasting energy. This steady stream keeps your energy levels consistent during your workout. Oats also contain B vitamins, which help convert carbohydrates into energy. After a long workout, your body needs nutrients to replenish what it has lost, and nothing could be handier or more nutritious than the right smoothie. 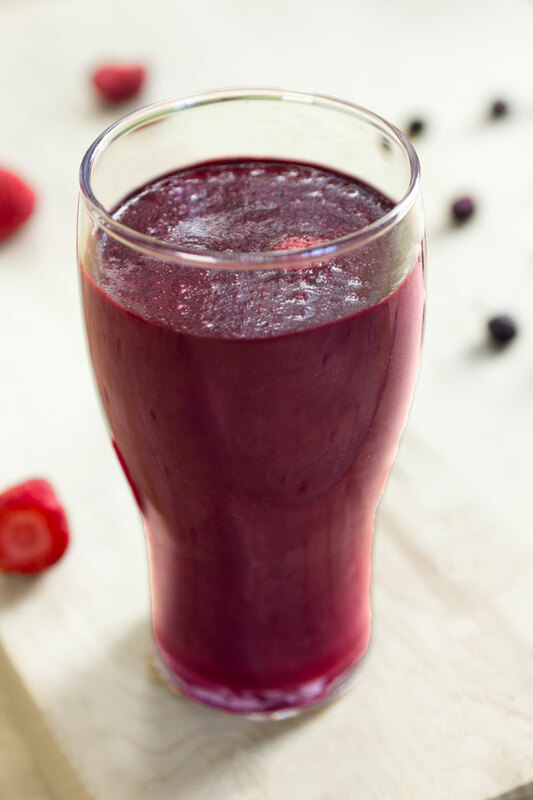 Smoothies are easy to make and digest, offer a simple way to get the protein you need to build muscle, the carbs you need to restore the glycogen you burned during exercise, and antioxidants that fight inflammation and cell damage. Avocados – avocados are incredibly high in potassium, which can help prevent muscle cramping after a workout. In fact, a typical avocado contains 35% more potassium than a famous banana. Avocados also supply a healthy dose of monounsaturated fats, which are critical for energy and vitamin absorption. Cacao powder – raw cacao helps lower the oxidative stress of strenuous activities because of the high levels of magnesium, chromium, B vitamins and antioxidants – thus helping athletes to shorten their recovery time. Cacao also has the highest levels of magnesium than any other food source on the planet! Coconut water – the main reason coconut water is marketed as a sports drink is because of its electrolyte content. As is the case with most sports drinks, coconut water supplies electrolytes lost during exercise, including sodium, potassium, chloride, calcium, and magnesium. In addition, the low sugar content of coconut water, especially when compared to artificially sweetened sports drinks, makes it a favorable choice for athletes. Hemp seeds – hemp hearts are the perfect source of easily digestible protein. Not only do they contain all 20 amino acids, but also each of the nine essential amino acids that your body can’t produce. Hemp seeds are also more nutritionally dense than many commercially available protein powders. Leafy greens & Lemon juice – intense exercise creates an acidic environment in your body. If you don’t neutralize the acid with what you eat, your body will use the calcium from your bones and nitrogen from your muscle tissue to neutralize it. Greens, sprouted vegetables, and certain fruits like lemons have a neutralizing effect on your body. The best healthy vegan smoothies are nutrient dense with a balanced ratio of all three macro-nutrients – carbohydrates, protein, and fat. While you can find plenty of balanced smoothie recipes online, they might not always suit your needs. Enter the perfect smoothie formula. Over the past few years, I’ve had a smoothie almost every single day. Some tasted incredible, some ended up in the sink. I experimented with new ingredients, and kept track of what worked and what didn’t. What follows is a formula that has worked for me every single time. It’s inspired by the No Meat Athlete’s Perfect Smoothie Formula and it’s foolproof. However, you don’t have to follow the guidelines to a T. You might determine that you want more or less of a certain ingredient, or more than one ingredient from each category. So be creative, and don’t worry if at first you like more of the sweet ingredients and not so much of the healthier ones. Over time as you eat more foods close to their natural state, your tastes will change and you’ll actually crave the healthy stuff. 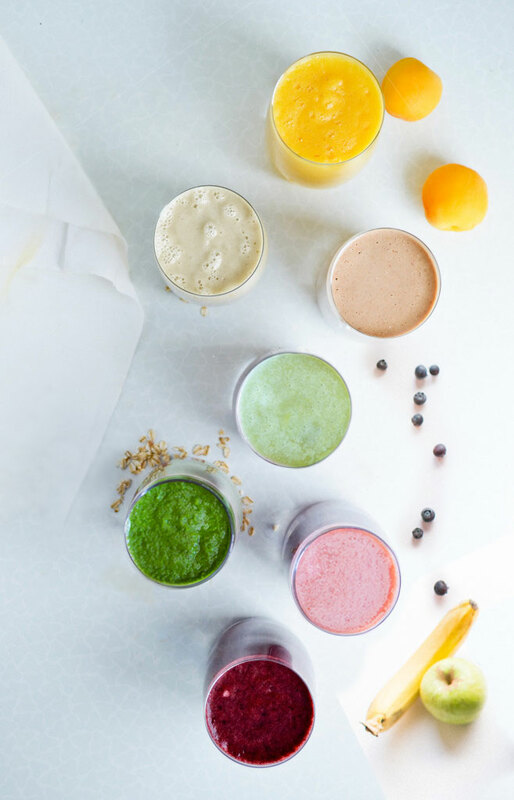 7 healthy vegan smoothies for any occasion - detox, slimming, energy-boosting, antioxidant, anti-inflammatory, pre-workout, and post-workout. 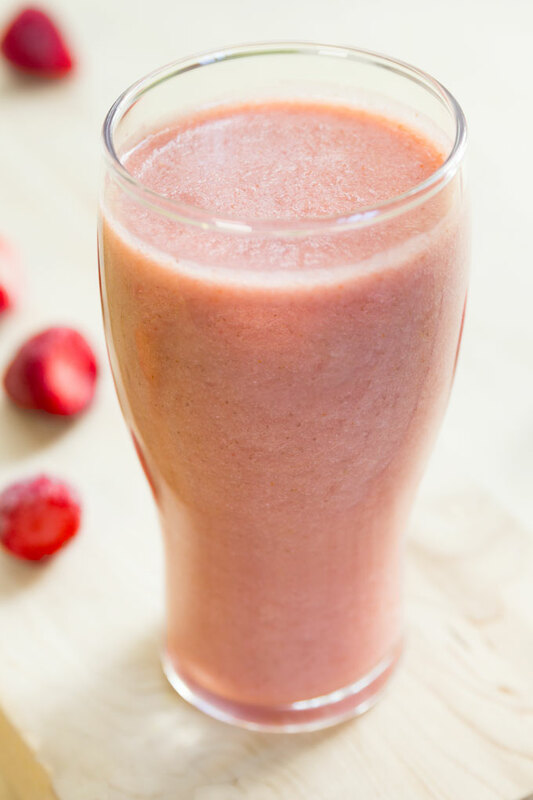 Store leftover smoothies in an airtight container in the refrigerator for 1 day. Just trying to eat healthier. Thank you so much for the kind comment, Olga! So happy you’re enjoying the recipes 🙂 I would use baby spinach (or some other type of leafy green) instead of kale, mango instead of pineapple, and orange instead of grapefruit (just note that orange doesn’t have the same “weight loss” effect that grapefruit does). Please, let me know if you have any more questions. Indeed I do have a couple of silicone small kitchen tools, which I utilize for my raw foods. I did not give it a thought about using silicone for baking needs. Though I did read that silicone used for baking imparts a “strange” taste to foods being “cooked.” Additonally am not sure I would like the idea of any particular flavoured loaf be it savory or sweet to not brown on all sides. Any thoughts on this? Thanks ! Absolutely amazing work. Delicious recipes! Thanks for shearing all recipes. Thanks for good information especially the classification. That’s very helpful! For the breakfast, pre workout smoothie why do you need to add hot water to the oats? Why not just add some water with the oats to the blender?